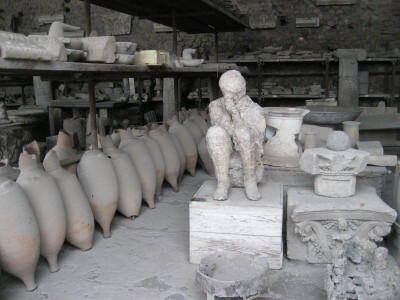 We had reserved our car for pickup today so that we could drive to Pompeii, but it was just too convenient to take the train to Pompeii from Sorrento, so we postponed picking up the car until tomorrow. 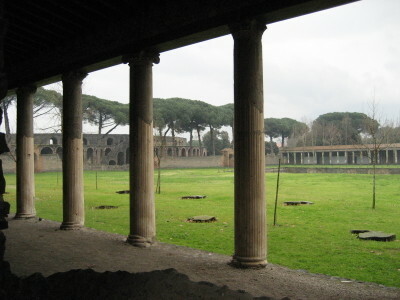 It took about 30 minutes to get there on the regional Circumvesuviana train, and the Pompeii station was just a few steps from the ticket office. 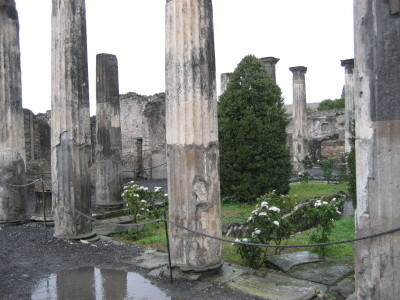 While exploring Pompeii in the pouring rain, what impressed us the most was the sheer size of this ancient city of approximately 25,000 inhabitants, dug out from the cinders and ashes that completely buried it, along with the neighboring community of Herculaneum, on August 24 in 79 A.D. when Mount Vesuvius erupted violently in one of the most devastating disasters in history. 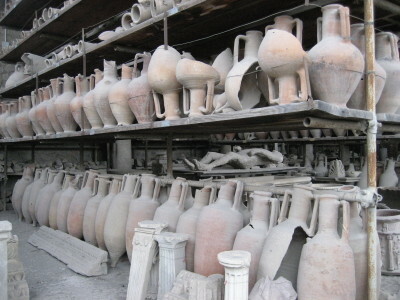 According to the self-guided audio tour, in order to prevent looting, and to preserve the property and belongings of the families of the diminished citizens, it was decreed that nobody could step foot into the areas of devastation. These buried cities must have been forgotten as time marched past, and it was only in the late 16th century that they were stumbled across by an engineer working on re-routing the River Sarno. It was yet another century and a half later that the excavation of the two cities got underway, mostly by fortune seekers hunting for treasures. 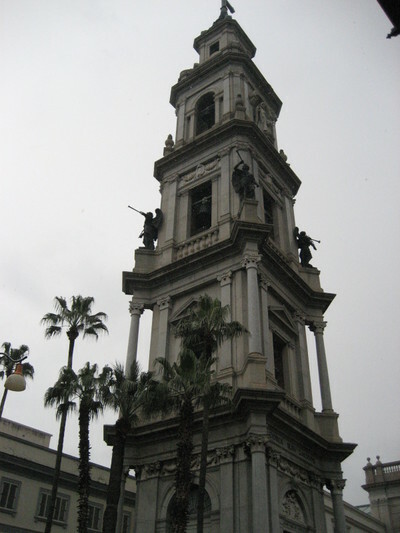 It wasn’t until the 1860s that a systematic approach to unearthing the cities, layer by layer, was led by Giuseppe Fiorelli. 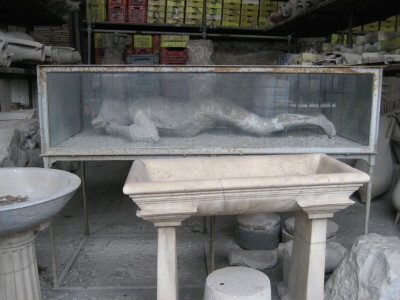 It was Fiorelli who came up with the technique of creating plaster casts out of the air pockets left between the layers of volcanic ash by the decomposing bodies buried in the eruption. It was the human remains he found in these air pockets that made him realize that they were formed by human bodies. 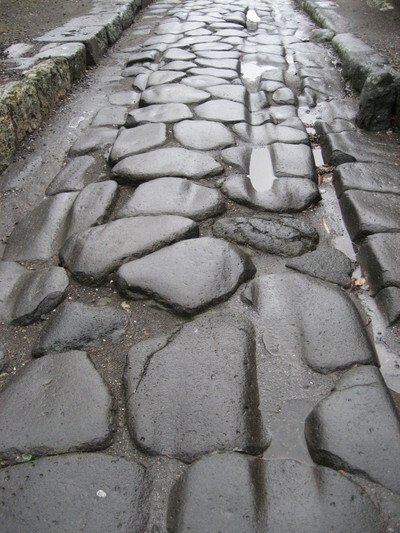 The roads in Pompeii were laid out in a straight grid, which was typical Roman style at the time. 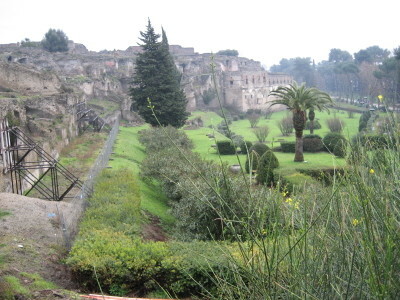 The ruts in the road still remain from when they were cut into the stone by chariots and carts when Pompeii thrived as a rich, bustling vacation destination. 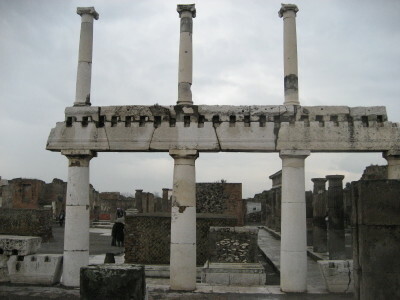 After our visit to the fascinating ancient city, we sloshed over to the modern city of Pompeii with our umbrellas separating us from the pouring-down rain, just to see what it was like. It might be more interesting when the sun is out, but the weather today did not motivate us to do too much exploring, so after a glass of wine in a small café off the main square, we sloshed our way back to the train station and headed back to our home base in Sorrento. 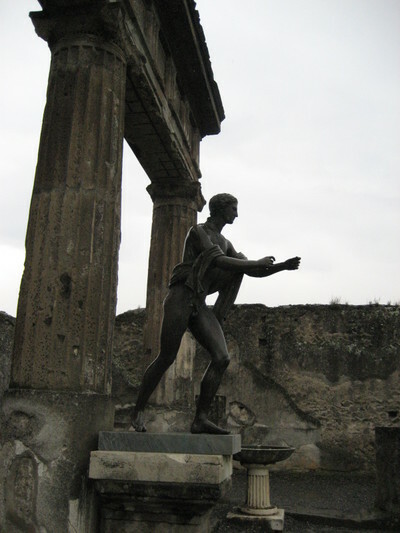 Pompeii is an amazing place, isn't it? We enjoyed our tour and were astounded by the things they found. You know, I think it rained when we were there too.